About the Reviewer: Dr Katherine Isobel Baxter is Senior Lecturer in English Literature at Northumbria University. Recent publications include: Joseph Conrad and the Swan Song of Romance (Ashgate 2010) and co-editor of Joseph Conrad and the Performing Arts (2009). In 2004 she was presented the Bruce Harkness Young Conrad Scholar Prize by the Joseph Conrad Society of America. Carol Reed’s adaptation of Joseph Conrad’s novel, An Outcast of the Islands, was originally released in 1951. 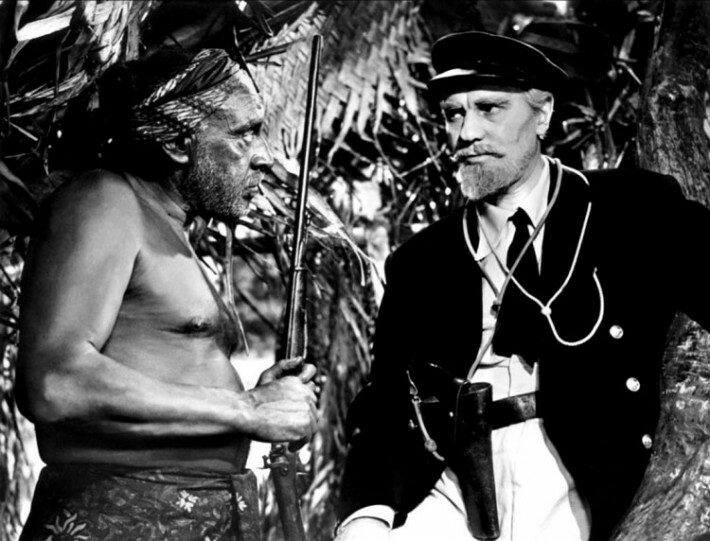 Trevor Howard plays the ‘outcast’, Willems, who is sent by his patron, Lingard (Ralph Richardson), to assist at one of Lingard’s trading stations in Borneo. Stuck in this remote location, with only Almayer (Robert Morley), the station’s jealous manager, and his family for company, Willems pursues and finally seduces, Aissa, the daughter of one of the local chiefs. At the same time Willems betrays Lingard’s trust by making known to his competitors the navigational secrets required to reach the secluded trading station. Shot in Ceylon, with footage from Borneo edited in, the film is more culturally evocative than culturally accurate. The opening, panning shot of a busy ‘Bangkok’ quayside features a mixed Asian cast and two elephants whose presence is clearly intended to authenticate the oriental location. The scenes at the trading station involve a similar cast of silent Asian extras, who are often filmed from a distance and in motion, thus reducing the audience’s capacity to identify incongruities. These incongruities, however, are evident in other areas of casting. The Malayan male lead was given to a heavily made-up Greek-British actor George Coulouris; and Aissa is played by Miriam Charrière, a non-professional actress, whose French-Arab features were passed off as ‘native’ in publicity for the film. Elsewhere, Reed simplifies the racial complexity of Conrad’s novel. Willems and Almayer’s half-caste wives are played in the film as unambiguously white by Betty Ann Davies and Wendy Hiller. This simplification makes Willems involvement with Aissa more obviously transgressive, underscoring his failure as a white man in the colonies. Aside from issues of casting, Reed’s main alteration is to leave out the fifth and final section of the novel, in which Aissa kills Willems. Instead the film ends with Willems thrown off by Lingard, and trapped in a relationship of mutual hatred with Aissa. This ending has the result of reinforcing the association Reed develops between Ralph Richardson’s Lingard and Conrad the author. Dressed in dapper nautical attire, with greyed hair, false moustache and beard, Richardson’s appearance is clearly modelled on Conrad’s. Thus, in the film’s conclusion the captain, who can give and take away the chance of success for those in his patronage, is made to parallel the author, who likewise controls the destinies of his protagonists. When Richardson’s Lingard condemns Willems to his fate at the end, Reed reminds his audience that this is Conrad’s condemnation of Willems too. From a technical standpoint, the film is interesting for its varied use of montage. At the trading station such sequences not only allow Reed to divert the audience from noticing the anachronisms in casting, noted above, they are also used to convey the overwhelming nature of Willems’s new environment. Similar scenes are used as the backdrop to Willems’s listless infatuation with Aissa. Elsewhere, montage is used to increase the drama of the nautical scenes where first Lingard, and later Willems, navigate rocks and shoals to reach the hidden trading station. Reed cuts back and forth rapidly, using tight angles to show the view from the brig and then shots of the brig itself tossing upon swift currents and menacing breakers. Widely understood to be one of the best adaptations of Conrad’s fiction, Reed’s film captures the torpor and dissipation of the original. As a result, it provides not only a useful introduction to the major themes of the novel, but also an interesting point of comparison to other post-war adaptations, such as Richard Brooks’s Lord Jim (1965). Moreover, the film is equally important to an understanding of Reed’s oeuvre as a whole. One of his few films shot on location outside of Europe it continues Reed’s post-war interest in betrayal, fantasy, and egotism. This re-release from STUDIOCANAL thus provides a useful resource both for film studies and for literary studies.